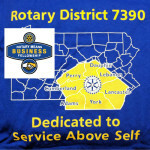 A collaboration of South Central PA business people and professionals who believe Rotarians should honor the roots of our great worldwide organization and support one another in business and professional endeavors. We just completed the 47th event of our RMB District 7390 history since its beginning in July of 2014 with a very successful networking event held on January 15, 2019 with over 30 Rotarians and guests from over 10 district clubs attending. Kudos go to the hosting club – the Rotary Club of York East and their club president Ben Marchant.